two hands on the cover offering a warm and alive heart portray our mission. the TPM organ donation programs. keep moving forward in collaboration. The course took place between the 10th and the 14th of November in 2014 in Vilar Rural Sant Hilari Sacalm. 44 students from 19 different countries and 22 professors joined the course. The Spanish edition of the Advanced TPM course took place from the 18th to the 21st of February in Vilar Rural Sant Hilari Sacalm. 47 students enrolled in the course from 9 different countries and 20 professors from highly recognized institutions. It should be highlighted that one Chinese delegation attended this course: 4 doctors from intensive medicine, 2 transplant surgeons and two agents from the Chinese National Organization CLTR. After the course, the delegation visited the OCATT, some hospitals in Barcelona and the DTI Foundation. The opening session was located at Parc Científic de Barcelona, and the course has integrated the trending topic on controlled and non-controlled donation after circulatory death. ITALY A new delegation model was implemented through a collaboration agreement with Centro Nazionale di Trapianti (CNT). This new model includes the implementation of the courses and the cession of teaching contents in Italian. Two advanced courses were carried out in November and December. PORTUGAL The Instituto Português do Sangue e da Trasplantaçao (IPTS), who has shown an ongoing interest on TPM training activities, organized an advanced TPM training course. It was adjusted to the country’s needs and counted with the support of Portuguese professionals already familiarized with the TPM training model. COLOMBIA - COMBI BOGOTÁ The INS (National Institute of Health), coordinator of the National Transplant and Donation Network in Colombia, and in collaboration with DTI Foundation within a 5 years collaboration project, has arranged the third round of visits to public and private hospitals in April 2014. Besides that, the Self-Study Online Course on Operational Management in Organ Donation and Transplantation was carried out with 256 students from all the Colombian regions. CHINA - COMBI KUNMING A TPM Intermediate Training Course took place on the 4th and 5th of December 2014 to train 40 health professionals in Kunming. A DTI group of experts visited hospitals of reference from KHOPO (Kunming Organ Procurement Organization) with the aim to get in contact with the practices on Donation and Transplantation. Once the visits and course were concluded, the team had a meeting with the organization to evaluate the current situation and plan future activities. IRAN Two courses addressed to different audiences were carried out in August. One of them was addressed to transplant coordinators soon or already on duty and the second one was addressed to experienced coordinators with the aim of developing their management and leadership skills. 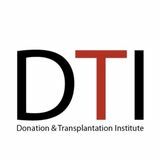 USA During the 3rd Transplant Donation Global Leadership Symposium, DTI was responsible to plan and design the educational program, the didactics and methodology application as well as contribute on professional experts. In addition, DTI collaborated on the assignation of scholarships aimed to key members from the international community. EGYPT We realized the 2nd Intermediate Training Course in Transplant Procurement Management during the 13th and 15th of June in Aswan (Egypt) within the participation of 35 students. CROATIA The Intermediate Training course in Transplant Coordination was celebrated between the 8th and 10th of October within the collaboration agreement with Donor Transplant Network and the Health Ministry of Croatia in Zagreb (Croatia). What’s going on in the world? SLOVENIA We realized the 3rd Intermediate Training Course in Transplant Coordination during the 19th and 21st of November in Mozirjie ((Ljubljana), as part of the 3 years agreement with Slovenia-Transplant signed on 2012. • Over 1 million trasplants are needed around the world • 100,000 transplants are done per year, yet 10% of the world’s needs are actually covered. • In Europe, just 48% of the needed transplants are being carried out. HUNGARY Within the Congress framework Donation after Circulatory Death: Controlled & Uncontrolled procedures. 2014 European Organ Donation Congress, 25th EDCTO a section of ESOT, a TPM Seminar that counted with 15 participants was carried out on the 2nd of October. Both practical sessions and theoretical content were positively valuated. • Spain beats records and keeps being world leader in 2014: 36 donors per million population. INTERNATIONAL MASTER IN DONATION OF ORGANS, TISSUES AND CELLS FOR TRANSPLANTATION The program has reached its 10th edition. The training is composed of different modules: Professional Training in Organ Donation, Training for Trainers, Leadership and Quality Management, Tissue Banking and Advanced Therapies. The educational methodology is blended, which combines virtual training through the online TPM platform and on the other hand, some face to face parts that take place at the Faculty of Medicine of the University of Barcelona (UB). During the 10th edition of this master, 20 students from 10 different countries participated in the program. Educational virtual platform The new TPM virtual platform allows a personalized learning process and adapts the different professional needs of the students. Moreover, several new learning tools have been added. The platform is intuitive and its interface contains different easy functions. The courses have been structured in a very clear way in order to make the distant learning process favorable. liams and San Fernando. - A health professional linked to Repsol has been incorporated to the project: Dr Ana Sim贸n is a neurologist relative to a Repsol worker allocated in T&T. Dr Sim贸n has been incorporated to the executive team of the project. EMPODaT (European Mediterranean Postgraduate Program in Organ Donation and Transplantation) is a European program witin the TEMPUS project coordinated by the University of Barcelona and financed by the European Commission on the Educational, Audiovisual and Cultural Field (EACEA). Its main objective is to develop and implement a Postgraduate Program of Organ Donation and Transplantation in accordance with the European Area of Higher Education within 6 different Universities from Morocco, Egypt and Lebanon (ENPI countries – European Neighborhood Policy Partnership Instrument). The program is developed with 4 different European universities in Sweden, Germany, France and Spain and uses the blended educational methodology that provides a common framework to the 90 professionals to whom it is addressed. The training is given in the language of the beneficiary country, usually in English or French, which creates the basis for a European-Mediterranean training model of specialists in organ donation and transplantation. 04 Within our collaboration framework in the Twinning Project with Moldova and the Agence de la Biomedicine and OCATT, a diagnosis study to evaluate the training needs in organ donation, transplantation and tissue banking in Moldova has been developed. We have carried out an educational plan for the coordination of the face to face courses and online courses addressed to health professionals in the country. 7th WORLD CONGRESS ON TISSUE BANKING - 15th BAA ANNUAL SCIENTIFIC MEETING. IRODAT. INTERNATIONAL REGISTRY IN ORGAN DONATION AND TRANSPLANTATION IRODaT is a date base that facilitates information of activities per countries regarding donation and transplantation. IRODaT’s objective is to help health professionals, researchers and the general audience to have access to validated and certified information. Last November, IRODaT published a bulletin with the reported numbers per 71 countries concerning organ donation and transplantation in 2013. The numbers regarding to 2014 will be published in due course. More info: www.irodat.com. The Black Sea Project is coordinated by the European Council and its main objective is promoting the organ donation and transplant activity within those 9 countries: Armenia, Azerbaijan, Bulgaria, Georgia, Moldavia, Rumania, Russia, Turkey and Ukraine. In this project, both DTI and ONT are responsible for the Working Package 4 centralized on the study of clinical practices in Organ Donation and Transplantation in Turkey, Russia and Rumania. The last evaluation visit was in 2014 where an expert group from DTI proceeded to compare the situation within the three hospitals evaluated in 2013 with the aim of formulating recommendations to the Health Ministry, the National Agency of Transplantation and those hospitals that wanted to improve its activity. CD-P-TO IN ROME DTI Foundation has been invited to the 14th European Committee (Partial Agreement) on Organ Transplantation (CD-P-TO) meeting in order to present its activity results within the BSA project. The meeting took place in Rome within the scope of Pope Francisco’s Audience and the activities related to the XVI edition of the European Day for Organ Donation. SOCIAL COUNCIL OF THE UNIVERSITY OF BARCELONA AND BOSCH I GIMPERA FOUNDATION AWARDS The Secondary Award Antoni Caparrós to the best technology and knowledge transfer project was given to Dr. Martí Manyalich Vidal for the project “Cascade training in organ and tissue donation and transplantation” from DTI Foundation. The Indian minister of health, Dr Harsh Vardhan, and his delegation visited the DTI offices in order to get to know the good practices in Spain towards the donation and transplantation field. The minister showed a great interest on DTI’s international work and projects as well as the results obtained on the latest years. PUBLICATIONS The Impact of TPM training on Organ Donation and Transplantation. 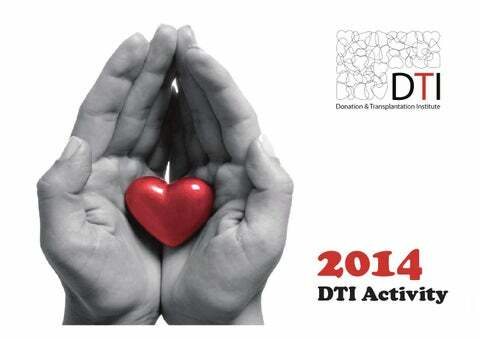 The specialized organ donation and transplantation training (D&T) is relevant to improve transplants. The main objective of this study was to investigate on the participants’ perceived benefits regarding TPM courses concerning the development of professional skills. For this study, it was elaborated a survey within 5 lan3rd EDITION OF THE guages (Spanish, English, Italian, French and Portuguese) and it was approved by the University of BarceTRANSPLANT lona (Spain) and the University of Purdue (USA). The COORDINATION MANUAL link was sent by post to 6839 individuals and we asked them to send it to other active professionals related to The 3rd Edition of the Transplant Coordination Man- the field. It was shared on Facebook and in congressual was edited in 2014 and now is available in either es as well. Two research questions were identified reprinted or digital form. 63 international experts garding the perceived influence from the specialized collaborated on this Edition. The Manual has a high training programs. The article of the study have been educational value because it constitutes the vast edu- accepted for publication on Experimental and Clinical Transplantation. cational sources for the TPM courses. 10.772 persons from all around the world have participated in a TPM training offered by DTI Foundation. DTI Foundation has worked with in 101 countries and has the willingness to continue growing.